New York, NY – A promised investigation that could definitively determine if cable-TV giant Charter/Spectrum is in violation of its Franchise Agreement with the City of New York will commence by September 1, LaborPress has learned. DoITT’s Kate Blumm on LaborPress’ Blue Collar Buzz. Six months ago, DoITT determined that Charter/Spectrum was using an “overly broad interpretation of the term ‘located in New York City’ as it refers to Article 17 of the Franchise Agreement and the use of contract workers. Charter/Spectrum immediately balked, claiming that more than 75-percent of its vendors were located in the city. 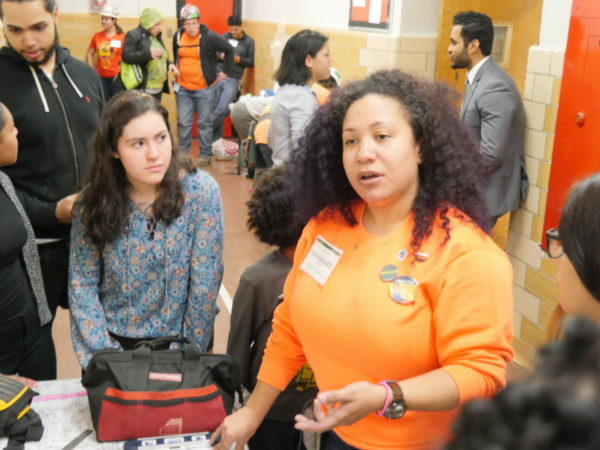 As a result, DoITT decided to interpret the term “located in the city” for them, and vowed to launch a new audit to determine compliance with the criteria set forth. Blumm talked about the exchange between DoITT and Charter/Spectrum during the March 13, episode of LaborPress’ “Blue Collar Buzz” podcast. Striking IBEW Local 3 workers say it’s evident Charter/Spectrum has violated its Franchise Agreement with NYC. Striking IBEW Local 3 workers and their families, have long maintained that it is, in fact, quite apparent that Charter/Spectrum is using an abundance of out-of-state contractors in violation of Article 17 of the Franchise Agreement. They point to the presence of commercial vehicles cruising city streets with Charter/Spectrum identification and out-of-state license plates, as well as others similar vehicles found weirdly parked on quiet residential blocks. 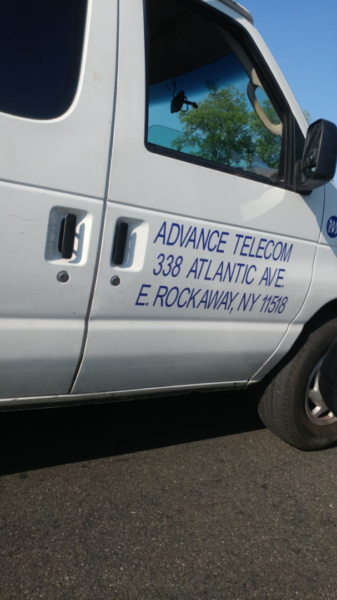 In one curious instance, a commercial van spotted on Staten Island with Charter/Spectrum identification was found bearing the address of a Far Rockaway florist shop. When striking workers visited the site at 338 Atlantic Avenue, they reported finding similar vehicles parked behind the retail store. They pointed us to a Macmillan online dictionary definition of what the word ‘located’ means — and we kind of looked at ourselves and were scratching our heads. — DoITT Assistant Commissioner Kate Blumm. The city’s announcement that it will once again audit Charter/Spectrum comes at the same time as Public Service Commission Chair John B. Rhodes’ announcement that his agency plans to get tougher on the cable-TV giant for allegedly failing to live up to its contractual obligations with New York State, as well as issuing false claims to the public. 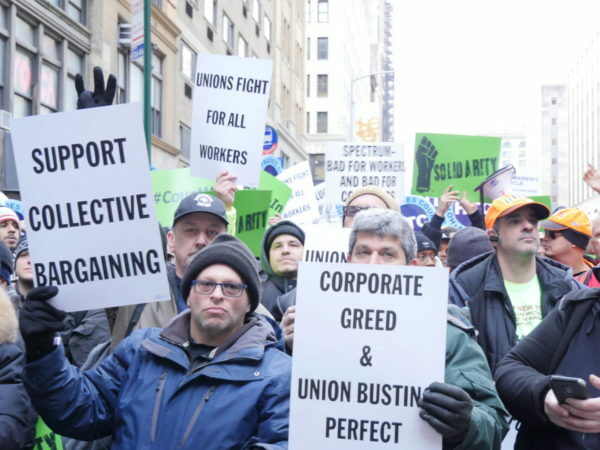 Union workers rally outside Charter/Spectrum offices on W. 23rd St. in March. Struggling striking workers without their Charter/Spectrum jobs since March 28, 2017, have heard this kind of tough talk before. Blumm acknowledged the growing frustration during her “Blue Collar Buzz” appearance, but also suggested that the administration’s hands are tied. 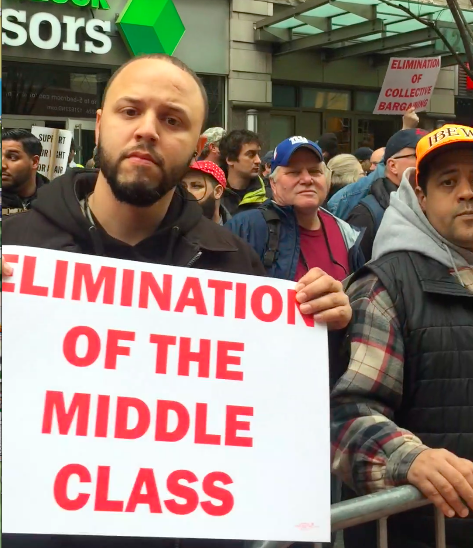 Sanela Djencic, wife of striking IBEW Local 3 worker Vedat Djencic, confronted Mayor Bill de Blasio about Charter/Spectrum’s alleged Franchise Agreement violations almost a year ago, during an episode of the Brian Lehrer show on WNYC. Hope something will work for us in the end..